Three Super Bowl titles and the power of the Cowboy's fan base ensures that Troy Aikman will remain high on the collecting radar for years to come. The Hall of Fame quarterback is a popular player for card collectors and we take a look at ten top Troy Aikman card options across all budgets. While there are many rare Troy Aikman cards, the list below is intended to provide a good mix of price points, as well as overall hobby significance. 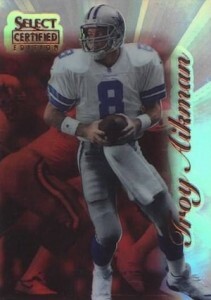 Let us know in the comments if there are any other Troy Aikman cards you think are worth highlighting. 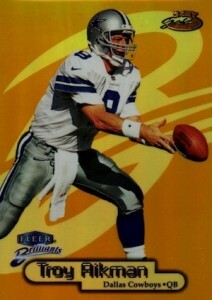 A mishmash of colors and shapes combine to make for an unappealing, but still memorable, rookie card for Troy Aikman. Despite being one of just three rookie options for the Hall of Fame quarterback, PSA 10 versions of the 1989 Pro Set card regularly go for $20 or less. 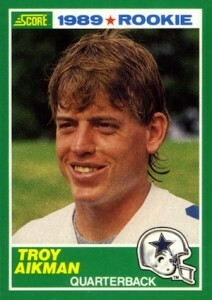 The most poplar and valuable Troy Aikman rookie card comes courtesy of 1989 Score. 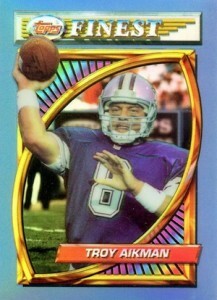 The boyish grin and simple design make for one of the most iconic Troy Aikman cards of all-time. 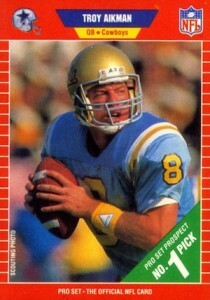 Simple to the point of being boring, 1989 Topps Traded is definitely a Troy Aikman card for the collecting pursuits. Although Score seems to get all the recognitions, Topps Traded is still a worthy add. There are plenty of other signed cards available for Troy Aikman, but his 1991 Pro Line Portraits Autograph was the very first. 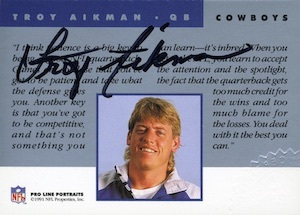 An abnormal image choice and the fact that they were signed on the back of the card makes this one of the most affordable Troy Aikman autograph options. Modern and retro at the same time, 1994 Finest remains a pivotal set for collectors even if it does not have autographs or low print runs. 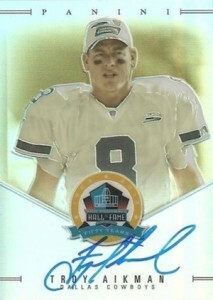 The Refractor parallel for Troy Aikman adds a dose of rarity and value, but is still not difficult to track down. While it came before numbered parallels were a regular component of card collecting, 1996 Select Certified still has enough flash to warrant attention. Among a variety of parallel options across the color spectrum, the Mirror Red Premium Stock card was the rarest for Troy Aikman, with an announced print run of only 20. Collector's Edge did some pretty cool things with cards in the 1990s. Troy Aikman's very first memorabilia card contains a piece of game-used football and is found in 1996 Collector's Edge Advantage. There is also an insert that features a game-used Super Bowl game ball for Aikman from the same product. 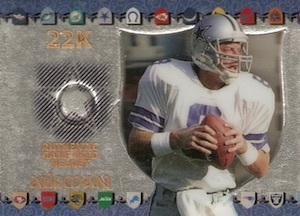 However, another early Troy Aikman relic card is found in 1997 Collector's Edge Excalibur and features a game-used helmet piece and 22K gold foil. While not numbered, the reported print run is 249 copies, so they don't pop up often. A Troy Aikman card with an obvious gold theme, this 1998 Fleer Brilliants parallel includes a 24KT gold stamped logo on the front of the card. While the card is appropriately numbered to 24, there are other parallels available that are easier to locate. The Ring of Honor insert set in 2002 Topps is a tribute to the former Super Bowl MVPs. 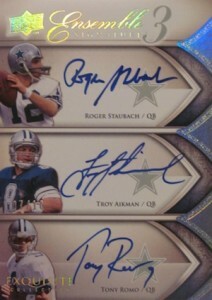 The large on-card signature and bold look makes it a strong Troy Aikman card on its own. The card takes on added significance for fans of the Dallas Cowboys, as they are one of several teams that induct their best overall players into the team's Ring of Honor. It is hard to go wrong with any on-card autograph for Troy Aikman, but this Panini card has several attributes that make it stand out. The classic design is modernized with a Refractor-like finish and on-card signature. Limited to just 50 copies, the design is from the 2013 Spectra 50th Anniversary HOF Signatures set, but is actually found as an insert in 2014 Contenders. 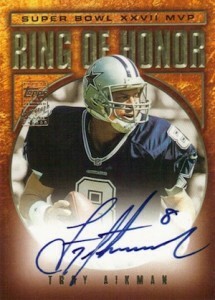 Taking Troy Aikman autographs to the next level, there are quite a few multi-signed card options that have been produced over the years that pair Aikman with current and former players. Obviously, the most popular and valuable cards feature him alongside other Hall of Fame players, especially other former greats for the Cowboys. Check out the available options by following the links to eBay. 1989 SCORE #270 TROY AIKMAN RC ROOKIE CARD KSA 10 GEM MINT!! I have 3 sons and we have collected. Sports cards for the last 20 years. Now that they are moving on and living their lives, they would like to know if they have can sell their cards for a decent price. What would you recommend? 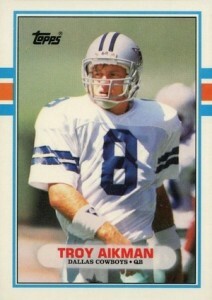 I have a Troy Aikman card from 1990. It is from Pro Set but has a star logo with PRRO files trademark. I won this in a contest. I think from a TV sports show. It is a torso shot without a helmet on. I cannot find this card anywhere on the intranet. How can I find out the value of this card. I have a card with Troy airman in full cowboys uniform but says Texas rangers “ name of the game “ : I thought Mr Aikman played entirely for Dallas cowboys. ?